Have you ever wished if you had a bigger screen for your Smartphone? Or, have you ever thought of integrating your Smartphone/Tablet PC to your computer so that you can simultaneously keep track of both these devices? If answer for both of these questions is ‘YES’, we hope it is your time to check out MoboRobo, which is an all-in-one solution to manage your Android Smartphones & iPhones! According to our experience, MoboRobo, the most useful tool for any Smartphone vendors, seemed to be a superb way to manage information in Android Smartphones [We used an Android Smartphone to understand MoboRobo], and it seems that each power-user of Android/iOS should check this completely free software for Windows PCs. In addition, to let you understand the real value of MoboRobo, when productivity is concerned, we would like to do a review of MoboRobo as well as its important features. Firstly, we would check out how you can connect the Android Smartphone to the PC, and hence manage your information using the big screen of your PC in a productive way. • Smartphone vendors have many kinds of advantages from MoboRobo. They can use MoboRobo to install big number of Android/iPhone applications in devices, when they sell the device. Through this, you can receive a great customer support, and it is quite productive for both the vendor and customer. • Since the software supports transfer of contacts from different platforms or same platform, vendors can use it when one customer requests them to convert all their important contacts into the newly bought device. As the previously mentioned case, this feature is also equally productive, indeed. • MoboRobo comes with the support of a specialized Android Download Centre. From this store, users can get popular and useful Android application for different requirements. For instance, this feature would be quite useful if you have an Android device that lacks Google Play Store. Also, it seems while using the tool, process of installing those apps is simply superb. Installation of MoboRobo is quite simple than you guess, and it would take less than a few seconds! Since MoboRobo is a free tool, you can download the 22MB file from the official website, and finish the installation instantly. Once the installation is over, you can see a home screen of the tool, which is shown in the following image. 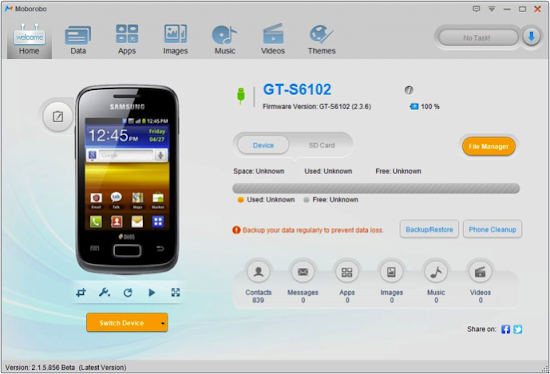 Now, you have the duty to connect your Android Smartphone through the convincing method. You can use either an USB Cable or Wi-Fi to establish connection between PC and your Smartphone. However, if you want to avail all features of MoboRobo, it would be wise to prefer USB method to the other. Once you have chosen the suitable method and connected to PC, you can start exploring productive features of MoboRobo. Now, shall we check out important features of this tool? It would be easy, we hope, to know the practical purposes of MoboRobo rather than technical aspects of tool. Nowadays, we would not wonder if you say that the information you have stored in Smartphone is valuable than the device itself. In that sense, especially if you are using the Smartphone to handle your sensitive information, it will be great to ensure data you have stored! You can backup different information such as call logs, apps etc. in a few clicks. When you have lost the information on the device or formatted it, you can use the restore feature to copy all these information to the Smartphone. Among these, we consider the option to backup Apps in the pivotal position, which is quite useful for the pro-user! Due to the smaller screen of device as well as issues with your internet connection, installing Applications in Android may be a matter of tiresome. Now, however, if you have a good internet connection in your PC, you can fix the issue, as MoboRobo lets you install popular applications in the device as if you are using Google Play Store. 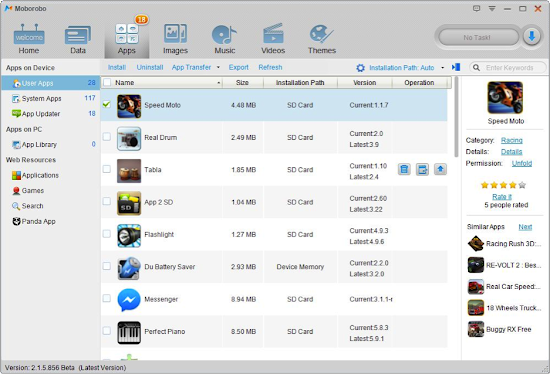 Another feature of MoboRobo is the ability to transfer applications from Micro-SD card to the system memory and vice versa. In our experience, it seemed MoboRobo was able to move apps from system memory to SD card, which were not possible in the default method. As we mentioned earlier, the official store of MoboRobo is as rich as the Google Play Store, as it has arranged all those application neatly in appropriate categories. Also, you have the ability to update Apps, you have installed, through single click. On top of these advantages, you can cut off your 3G usage if you use MoboRobo to install apps from the store. This feature is quite useful for those who have a bad internet connection in their device, but have a good one in the computer. In addition to this, there is an Application from MoboRobo, which is dubbed as MoboMarket, using which both vendors and users can download desired applications for their Android Device. As we mentioned earlier, this feature makes enough sense if you do not have Google Play installed in the device. When using MoboRobo, you can manage all your contacts with a few clicks whereas you will spend more time when using the device. In MoboRobo, you have the ability to edit contacts, export and import contacts, add new contacts, as well as to backup/restore. When compared to that of device, the process of editing contacts is quite simple in this tool, and you can find duplicate contacts quickly as well. Through the contact export and import feature, it is possible to transfer your contacts from your old phone to the new one. At the same time, if you are shifting from a platform to another one (say Android to iOS), MoboRobo will be very useful, as the tool takes no time to transfer contacts. At the same time, MoboRobo provides an effective platform to manage your SMS messages. Once you connected the device with PC, you will receive message notifications on your PC. Of course, when you use MoboRobo, you do not have to lean your hands towards the Smartphone to reply to SMSs. On the other hand, almost everything would be possible through your PC. According to our perspective, this is one of outstanding features of MoboRobo. Although the tool does not allow receiving phone calls through mike of device, you can give a command to make a phone call from call logs section or turn on speaker. In addition to these, you can also check call logs of the device through an intuitive user interface. MoboRobo has in-built features to manage your media files such as videos, wallpapers, music etc. For all these kinds of categories, MoboRobo provides specific resource centers i.e. you can use the PandaApp Ringtone center to gather new ringtones for your Android device. Also, there is a file manager in the tool, which allows you manage your files in a quick manner. The file manager of MoboRobo is quite useful because this feature lets you explore different files of your device. In addition to these, if you have installed the Mobo Launcher, you can download and install superb themes for Android. To wrap up, while considering all the features of MoboRobo and the intuitive UI of the tool, MoboRobo seems to be an awesome tool for each Android/iOS lover! Since the tool is completely free, you should have a try on this tool and we are sure that MoboRobo will not disappoint you!